Chat Roulette is the latest chat-with-a-stranger-site. What separates it from the thousands of chat-with-a-stranger-sites already out there is that it has webcam support so you can see who you talk to. Casey Neistat has made a both funny and informative video about the site and what kind of people who use it. Turns out that 71% of the users are guys, 15% girls and 14% perverts. This video visualize the developement of twitter.com. One icon for each developer and a particle for each commited or changed file. This video zooms into the Mandelbrot fractal for 10 minutes. At the end of the video the image in the beginning would be billions of times larger than the whole universe. Peter Sunde (the co-founder of The Pirate Bay) and Linus Olsson just created a new micro-payment service called Flattr. The word is a combination of "flatter" and "flat-rate" and the idea is that creators can place flattr-buttons along their content and the viewers can click them if they like the content. The users pay a monthly fee and in the end of the month their money will be divided among the creators they've flattr'ed. The project is still in beta but you can request an invite. 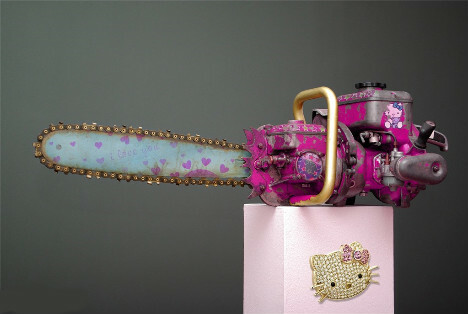 Awesome chainsaw design. Buy this and you'll be the coolest lumberjack out there. This video gives some good perspective on humanity. We're all just apes.